Empire Investment Report Review – Is Whitney Tilson’s Research Service Good? The Empire Investment Report – What you’ll receive for your money? To sum up, for the first time in his career, Whitney Tilson will be sharing the strategy he used for 20 years on Wall Street in a one-of-a-kind new research service called The Empire Investment Report. He’ll rank his top 12 recommendations in the model portfolio and show you exactly where he believes you could make the most money, every single month. For 20 years, Whitney only shared his best investment ideas at his New York City-based $200 million hedge fund. He hand-selected his clients from some of the wealthiest people in New York City. Many were multimillionaires, with access to the best Wall Street hedge funds. In hedge funds, you typically pay what’s known as “2 and 20”: 2% of your capital and 20% of your profits, which can cost a fortune. For example, on a $500,000 portfolio that earns just a 10% return in a year, you’d end up paying a total of $20,000 in fees! In other words: For years, you’d have never been able to access Whitney Tilson’s work without knowing the “Who’s Who” of Wall Street. He was essentially off-limits to all but the wealthiest investors. That’s why we believe the Empire Investment Report offers the most valuable deal you’ll come across for research of this caliber. For a tiny fraction of the price Whitney once charged his millionaire clients, you’ll have full access to Whitney’s best monthly recommendations, for the next year. For example, one of the first people to subscribe to this new research service is Joel Greenblatt, a billionaire who manages $9.5 billion at Gotham Capital. Or consider another subscriber to Whitney’s new research service hedge fund manager Lloyd Khaner, who manages about $100 million. One full year of the Empire Investment Report normally costs $5,000. If that sounds like too much money – then it probably isn’t suited for you. Whitney will be tapping his network and going behind-the-scenes to give you information and investment recommendations that would normally cost $10,000 for just a single report on Wall Street. He’ll be recommending lesser-known and smaller companies he’ll hear about by talking to CEOs, programmers, engineers, hedge fund managers and other experts who don’t normally open up to the public. In many cases, the ideas and predictions Whitney will be sharing will even make headlines in the U.S. financial media – which has happened dozens of times throughout his career. For example, just weeks ago, a new prediction he made about Tesla made Business Insider within just 24 hours. That’s why this new product is a rare chance to insert yourself into the beating heart of the investment world. If you don?t see the value in this, you?re better off sticking with a more conventional approach, and avoiding Whitney?s ideas completely. But because Whitney is stepping forward for the first time ever? And because he’s devoted almost all the free time throughout his career to charity, philanthropy, and helping others who don’t have the same advantages as him? Today, he’s agreed to make you a special charter offer. In short, Whitney Tilson wants to share his strategy with as many folks outside Wall Street as possible – to help you benefit from the kind of insight normally reserved for the most elite investors. That’s why if you sign up today, he’s agreed to give you $2,000 off the price. That’s a 40% discount, which means you can receive one full year of the Empire Investment Report for just $3,000. Just remember: This charter offer is only available for a brief time only – and will expire soon. You’ll receive instant access to Whitney’s model portfolio in the next few minutes. It contains his first, official, never-before-revealed recommendation. Like every investment that he recommends, you’ll have the potential to see a 100% to 500% gain or better! You’ll receive a new research briefing from Whitney each month for the next year. He’ll rank his top 12 investment recommendations at any given time – And he’ll give you any warnings, predictions and other information he sees to help you make the most money along the way. When he uncovers a special situation, like a company headed for bankruptcy or an outright fraud, he’ll sometimes hold a conference call. You’ll be invited to dial in and listen as Whitney and one of his colleagues brief you on the full situation, and what you should know. You’ll receive a password to Whitney Tilson’s website, where you’ll have full access to his research report: The Empire Investment Primer. Inside, he shares everything you need to know to begin using his strategy, on your own, no matter what your experience. Plus, his secret for finding inflection points – to see which stocks have the greatest potential to rise by 100% to 500% or more. This includes a secret “missing video” he’s never shared before, detailing why this stock could dramatically outperform the S&P 500 in ways that probably nobody outside the company itself is aware of. Throughout the month, Whitney will be in touch with you by e-mail, to let you know of any important updates – and when to close each new recommended position. Just remember: Because he’s releasing The Empire Investment Report for the first time ever, he’s offering you a special charter deal. If you get in today, before this offer expires, you’ll receive 40% OFF. And it gets even better? Through this special charter offer, you can try The Empire Investment Report 100% risk-free. In other words: Take the next 30 days to try Whitney Tilson’s new research service. Read his primer, look at his first recommendations and make your own decision. If you’re not completely happy, simply contact their Customer Service team within 30 days and you’ll get a full refund of your subscription. We’re so confident that you’ll love Whitney’s work, we’re making it 100% RISK-FREE for you to try it. Quite simply: Once you see the quality of his research, we doubt you’ll ask for a refund. Whitney is one of the most connected investors I’ve met. He’s been able to tap into an infinitely deep and unique network of people to come up with unique insights into ideas and develop them that other people just can’t do because they don’t have the same depth of network. Bottom-line: We believe Whitney Tilson could help you make more money over the coming months and years than almost any other analyst we’ve seen in the history of our business. Who the heck is Whithey Tilson – the man behind the Empire Investment Report Research Advisory? There’s nobody else quite like Whitney Tilson in the world of U.S. finance. He’s the child of two Peace Corps volunteers who launched a hedge fund from his New York City bedroom in 1999… with just $1 million. But over the next decade, he grew it to an incredible $200 million, and nearly tripled his investors’ money, even during a flat market – with 200% to 1,400% gains from a range of different investments. Whitney Tilson, the “Prophet” Ran hedge funds for nearly 20 years with peak assets of $200 million. In 2000, he predicted the dot-com crash. In early 2008, he predicted the housing crisis and the government bailout of the economy. And in December 2008 on 60 Minutes, he called the bottom of the stock market – just prior to the start of the longest bull market in history. He was a regular on CNBC, Bloomberg TV and Fox Business… has appeared on 60 Minutes, been profiled by the Wall Street Journal, the New York Times, the Washington Post, Forbes, CNN, Barron’s, Institutional Investor, Business Insider, Yahoo Finance and more. Author Jeff DysonPosted on April 17, 2019 Categories Empire Investment SummitTags #1 retirement stock, Empire Financial Research, Empire Financial Research Actual Member, Empire Financial Research Complaints, Empire Financial Research Fraud, Empire Financial Research Login, Empire Financial Research Performance, Empire Financial Research Price, Empire Financial Research Real User Review, Empire Financial Research Refund, Empire Financial Research Results, Empire Financial Research Review, Empire Financial Research Reviews, Empire Financial Research Scam, Empire Financial Research Stockgumshoe, Empire Financial Research Website, Empire Investment Report, Empire Investment Report Review, Empire Investment Report Reviews, Empire Investment Report Scam, Empire Investment Summit, Porter Stansberry, Porter Stansberry Empire Investment Report, Porter Stansberry Empire Investment Report Review, Porter Stansberry Empire Investment Report Reviews, Porter Stansberry Empire Investment Report Scam, Porter Stansberry Empire Investment Summit, The Empire Investment Primer, The Empire Investment Report, The Empire Investment Report Login, The Empire Investment Report Performance, The Empire Investment Report Price, The Empire Investment Report Real User Review, The Empire Investment Report Refund, The Empire Investment Report Results, The Empire Investment Report Review, The Empire Investment Report Reviews, The Empire Investment Report Scam, The Empire Investment Report Stockgumshoe, The Empire Investment Report Website, The Empire Investment Summit, Whitney Tilson Empire Financial Research, Whitney Tilson Empire Investment Report, Whitney Tilson Empire Investment Report Review, Whitney Tilson Empire Investment Report Reviews, Whitney Tilson Empire Investment Report Scam, Whitney Tilson Empire Investment Summit, Whitney Tilson Investment Newsletter, Whitney Tilson Research Advisory, Whitney Tilson StrategyLeave a comment on Empire Investment Report Review – Is Whitney Tilson’s Research Service Good? The moment I looked at this high-flying stock with a nosebleed valuation, I knew he was suggesting it as a short idea – in other words, a stock ripe for a fall. He was right. I quickly uncovered numerous red flags. Margins had inexplicably doubled in the previous 18 months. Plus, two federal agencies had recently raided the company for buying Chinese flooring made from illegal hardwoods, harvested in Siberia by the Russian mob and smuggled over the border. I put two and two together and concluded that the spike in margins was likely due (at least in part) to illegal sourcing practices across Lumber Liquidators’ supply chain. If so, the feds would surely discover this and put an end to it, which would squeeze the company’s margins… and stock price. So I made a big bet against the stock. I thought the odds were in my favor, but I had no idea this would turn into one of the most profitable investments of my career. While opportunities like my Lumber Liquidators short don’t come along every day, you can use some of the key takeaways today to find great investment opportunities – by spotting what the rest of the market fails to see. When I looked at Lumber Liquidators’ fundamentals in 2013, I saw a mediocre business that was a steady performer for two decades – up until 2011. Then, profit margins suddenly doubled, and investors bid up the stock until it traded at 50 times earnings. And this was after two federal agencies had raided the company’s headquarters. Normally, that’s the kind of thing that would knock a stock down by 50%. But the share price hadn’t budged. Instead, investors had lost their minds over a flooring retailer! At the same time, insiders at Lumber Liquidators were dumping stock like mad. Founder and Chairman Tom Sullivan sold one-third of his shares that year ($27 million) and CEO Rob Lynch sold every share he could ($11 million). If you want to find out what’s really going on with a company, you have to talk to the folks with boots on the ground – customers, competitors, employees, and so on. A few months after I went public with my questions about Lumber Liquidators, an industry insider came to me with exactly the information I was looking for. He had run a laminate flooring factory in China and told me that he tried to sell to Lumber Liquidators. But the company would only buy from him if he matched the prices of his competitors, which were 10% lower. He knew such prices were only possible by cutting corners and selling illegal – and dangerous – formaldehyde-drenched flooring. To test his story, I went out and paid a laboratory $5,000 to test three samples of the Chinese-made laminate flooring that Lumber Liquidators was selling. Sure enough, it was loaded with formaldehyde… two to six times higher than what was legally permitted. The most profitable investments come from betting against extreme investor sentiment… and, of course, being right! In 2012-2013, Lumber Liquidators’ shares had soared more than 600%. Investors were euphoric. The stock was priced to perfection. Once people found out the truth, I knew sentiment would reverse in a big way… And it did. The stock ended up crashing by 90% in only two years! Once I confirmed that the company was breaking laws and poisoning its customers, I had to decide how to share my findings broadly. I could have written an article or made another presentation at an investment conference. But that wouldn’t have reached a broad, national audience. Then, I had a brilliant idea: “This is the perfect story for 60 Minutes,” I thought. It’s not only one of the most-watched television shows in America, it also has fantastic credibility, especially for exposing wrongdoers. Better still, 60 Minutes had the resources I didn’t. It hired a team that smuggled hidden cameras into a number of Chinese factories supplying Lumber Liquidators. Posing as buyers, they caught the managers on camera admitting they were selling Lumber Liquidators toxic product! The episode aired the evening of Sunday, March 1, 2015. As word got out about the episode, the stock tumbled nearly 30% during the previous week. Then, the day after it aired, shares dropped another 25%… In total, over six months, the stock crashed more than 80%. By uncovering and exposing this scam, I made more than $4 million for myself and my investors – one of the biggest wins of my career. Now, I realize that most individual investors probably can’t call up CBS and take on a publicly traded company. But the lessons here still stand: Do good fundamental analysis, find an information edge, and take advantage of extreme investor sentiment. If you can do these three things consistently, you’ll make a fortune. Editor’s note: That wasn’t the only time Whitney went on 60 Minutes… In fact, he’s been called “the most connected man in U.S. finance,” appearing on Fox Business, CNBC, and more. Now, he’s airing a special event TONIGHT at 8 p.m. Eastern to share his newest prediction… and a strategy that could help you double or triple your money, starting this year. It’s free to tune in – join the guest list instantly right here. You see, buying into a stock that is falling sharply is generally a bad idea. While picking the bottom of a stock can lead to massive gains… if you buy at the wrong time, it can also lead to big losses. And, frankly, most of the time… that’s what happens. But there are times when the knife is so close to the ground – where the risk of further loss is minimal, and where the potential gains are so enormous – that it makes sense to reach out and grab it. Back in December 2013, LULU shares dropped nearly 20% overnight (point 1 on the chart) in reaction to some bad news from the company. Now, it doesn’t matter what the actual news was. The important thing to recognize here is that this was NOT a good time to buy shares of LULU. Bad news is usually NOT a one-time event. There’s almost always a second shoe to drop. So if you want to profit from “falling knives,” the first rule to follow is to never buy a stock on the first decline from bad news. There’s usually more trouble to come. 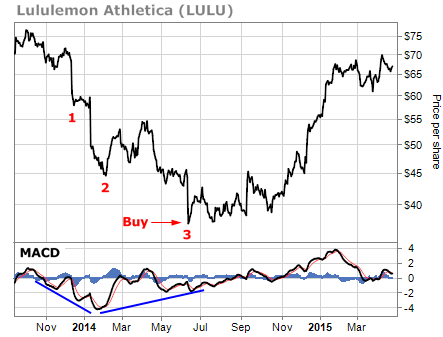 Sure enough, after a brief period of consolidation from mid-December 2013 to mid-January 2014, LULU once again tumbled 20% (point 2 on the chart) in reaction to bad news. This brings us to our second rule… After the second shoe has dropped, traders can start looking to buy – if the technical condition supports a bottom. I like to look at the moving average convergence divergence (MACD) momentum indicator to get an idea of where a stock is likely headed next. The MACD indicator helps to gauge the overall strength of a trend. For example, if a stock is dropping to new lows and the MACD indicator is hitting new lows as well, then the downtrend is strong and likely to continue. On the other hand, if the stock is dropping to new lows but the MACD indicator is rising, this “positive divergence” is likely an early sign that the trend is ready to reverse. 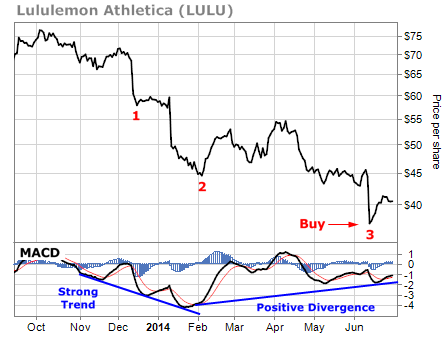 In the above chart, when LULU dropped to a new low in early February 2014, the MACD indicator also dropped to a new low – confirming the downtrend in the stock. With that, here’s the second rule to follow: No matter how attractive the stock might look at this point, traders should avoid the temptation to buy it if the technical condition doesn’t support a bottom. There’s still more room to fall and at least one more shoe to drop. That’s what happened in June 2014. Once again, LULU announced bad news and the stock fell 15% in one day (point 3). But notice the different action in the MACD indicator at this point. As LULU was dropping to a new low, the MACD was trending higher. This is the sort of positive divergence that reduces the risk of catching a falling knife. At this point, we had a stock that had fallen hard three times on bad news. It was trading for half the price it traded at six months earlier. And a key technical indicator was signaling that the trend was ready to reverse. This was a low-risk area for traders to buy. As you can see, LULU’s June 2014 low marked the bottom for the stock. But LULU didn’t mount a sustainable rally right away. Instead, the stock chopped around for a few months in a relatively tight trading range. Then it exploded higher. Anybody who caught the falling knife in June 2014 was sitting on around a 75% gain by the following March – just 10 months. Never buy a stock on the first decline from bad news. Only buy a stock when the technical condition of the stock supports a bottom. If you follow these two rules, you can set yourself up to make big profits with low risk from falling knives. Editor’s note: In today’s essay, we’re sharing more timeless advice from our friend and Empire Financial Research founder Whitney Tilson. Today, Whitney tackles one of the biggest mistakes you can make – and shares three simple steps to help you overcome it. It will go up. Or it will go down. In the beginning, it’s really that simple. You buy a stock with just two possible outcomes. But the truth is, things can get complicated really fast. And as that happens, it often leads to one of the biggest mistakes an investor can make… letting your emotions get in the way. When you let your emotions take over, you often rush into decisions that you’ll regret later… That’s the case no matter which way a stock is moving. One common and costly mistake is selling a big winner too early. Over the next two years, the stock rose sevenfold as Netflix’s streaming business grew. But as the stock kept moving higher, I made a terrible mistake… I started to let my emotions take over. After the stock doubled, I sold half my shares. And when it doubled again, I sold some more. As the stock was doubling a third time, I exited the position altogether. I thought I was conservatively managing risk and didn’t want to be greedy. But I had it backward… To build a successful long-term track record, you must be greedy when the opportunity arises. Finding a monster stock like Netflix only happens maybe once a decade – or even once in a lifetime. So it’s critical that you make the maximum amount of money on such moonshots. I should’ve made more than US$100 million on Netflix for myself and my investors. Instead, I made less than US$10 million. Of course, that’s not terrible… But it was a costly mistake. Take SodaStream, for example. Its machines help you turn regular tap water into sparking water with the touch of a button. I knew SodaStream had a great business model. The company sells something that people use over and over. And the carbon dioxide bottles in its machines need to be replaced regularly. So SodaStream made something like an 80 percent profit margin doing so. But the company had botched its marketing in the U.S. and was also relocating its main factory in Israel, so its sales and earnings were down. I patiently waited until the stock had been cut in half and bought a small position in 2014. It turns out that I was much too early. The company continued to struggle and the stock kept drifting lower and lower… for nearly two years! Making the right decision in these situations is critical. Had I stumbled into a “value trap” that would never turn around – in which case I needed to sell? Or was the company still strong, with fixable problems – in which case I should buy more? It was very painful losing so much money for so long. Emotionally, I wanted to sell and never think about this terrible investment again. But I was able to set aside my emotions and focus my analysis on the fundamentals, which remained strong. I added to my position all the way to the bottom – and was well rewarded. By the time I closed my funds in late 2017, it was up five times. And then PepsiCo (Nasdaq; ticker: PEP) bought the company last year for 12 times the price only two years earlier. First, assume the market is right and you’re wrong. You must begin with this mindset because it helps overcome the natural bias we all have to not want to admit a mistake. You must respect the market. The hard truth is that most of the time it’s right… and you’re wrong. My experience with SodaStream is the exception, not the rule. Then, you must figure out what you’ve missed and actively seek out disconfirming information. Redo your work… But don’t just rehash what you already did. That won’t lead to any new conclusions. Instead, you must ask – and honestly and correctly answer – a series of key questions. Have you made a research error? Are you possibly missing anything? Have you openly and carefully considered contrary arguments? Have you invented new reasons to own the stock (so-called “thesis drift”)? Many smart investors lost a lot of money owning film company Kodak’s stock in the decade before it filed for bankruptcy in January 2012. It wasn’t an unreasonable investment initially… The company had one of the strongest brands in the world, it generated robust cash flows, and its stock traded at a low multiple of earnings. Sure, digital photography was a threat to Kodak’s film business, but it seemed far off – and the company was making investments to compete in this space. For most investors who lost money with Kodak, the mistake wasn’t so much the initial purchase. Rather, it was failing to recognize that the film industry was rapidly being obliterated and that Kodak was getting no traction in the digital arena. So its profits were destined to disappear. The key is to tune out the noise and think clearly and rationally. Focus on the fundamentals… If the company’s earnings rebound, its stock will as well. Clinton did it. Obama did it. On April 17, it’s your turn. Warren Buffett, Bill Clinton, and Barack Obama have all met our newest partner. On April 17, it’s your turn. That day, a man who nearly tripled his investors’ money at a $200 million hedge fund is sharing a radical new financial opportunity. Lastly, to make the right decision, you must pretend like you don’t already own the stock. It’s so hard to make the right decision about a stock you’ve lost money on. The emotions are so powerful! On the other hand, your emotions are likely telling you to sell, so that you don’t have to suffer any more pain and never have to think about this terrible stock ever again. There’s also a powerful feeling of wanting to wait until it gets back to the price you bought it before selling. Doing nothing may be the best option, but you also must have the courage to admit a mistake and get out – or know that you haven’t made a mistake and buy more. If a stock is going against you, follow this simple three-step process. And if you wouldn’t buy the stock if you were starting a portfolio from scratch, then you should sell it immediately. Editor’s note: On April 17, at 8 p.m. Eastern time, Whitney will join Stansberry Research founder Porter Stansberry for a special investing event. He’ll reveal the secret to his investing success… and announce the biggest prediction of his career. Folks who tune in will even get the name and ticker of the company he calls the “No. 1 retirement stock in America”… just for showing up. Sign up for this free event right here. My parents met in the Peace Corps in 1962. I was born four years later and spent much of my childhood in Tanzania and Nicaragua. In between, we lived in California, where my father earned his doctorate in education at Stanford University. They say it’s better to be lucky than good. I’d like to think I was a little of both. Over the next dozen years, I grew assets under management to US$200 million, nearly tripling my investors’ money in a flat market. Toward the end, though, I made some key mistakes. I worried about another downturn, so I was too conservative with my portfolio… I took profits too quickly, held too much cash, and shorted too many stocks. After trailing this historic bull market for a number of years, I decided to close my funds and give my investors their money back. I’m incredibly proud of my time in the hedge fund world. But when Porter Stansberry approached me with the idea of starting my own publishing company, I jumped at the chance. My new venture – Empire Financial Research – will allow me to share what I’ve learned over the past few decades on Wall Street with individual investors like you. Anyway, that’s enough about me. The first step is the most important, and one: effective portfolio management. This is such an important skill for investors to have, but I didn’t fully appreciate this early in my career. When I got into the business, I thought all I had to do was find cheap stocks and be a good stock picker. It was only through hard experience that I came to learn that stock-picking is only half the battle. The other 50 percent is managing your portfolio, which can create or destroy as much value as the stocks you own. To borrow a baseball analogy, your batting average matters a lot less than your slugging percentage. It’s not how many of your picks are right… it’s how much money you make when you’re right versus how much you lose when you’re wrong. If you’re consistently sizing your best ideas too small, you’re hurting yourself just as much as if the stocks you buy go against you. Another huge mistake many individual investors make is not being greedy enough. If you’re sitting on a big winner that runs up 50 percent or 100 percent, trimming your position can stunt your returns tremendously. The opposite is true, too. When you hang on to your losers way too long – or worse yet, average down on your position – your losses can mount quickly. It’s critical to have the judgment, humility, and fortitude (which come from experience) to know when to let your winners run and cut your losses. Let’s say you’re a great stock picker and you assemble a portfolio of 10 companies… Over the next five years, seven of them are up big and the other three are down. Had you not touched your portfolio, your portfolio would have been in great shape. But if you’re a poor portfolio manager, things can really start to go haywire. In October 2012, I had nearly 5 percent of my portfolio in video-streaming company Netflix (Nasdaq; ticker: NFLX), right at its multiyear lows. And then it took off, becoming one of the greatest stocks of all time. But even though I had publicly predicted almost exactly what would happen, I only made about a tenth of what I should have. Because as the stock moved up, I kept selling and eventually exited far too early. Had I simply gone away on a five-year vacation, I would have done far, far better – it’s up almost 50 times since then! It’s painful for me to see (and admit) that my management of the portfolio left a lot of money on the table. I ended up taking a portfolio that would have crushed the market and significantly trailed it instead. In effect, my portfolio-management strategy was to pull my flowers and water my weeds… a deadly combination. It’s also critical to give your investments long enough to let your thesis play out. One of the biggest advantages individual investors have over professional money managers is the lack of short-term performance pressure. Even the people who manage endowments and pension funds – which by definition have multidecade investing horizons – are evaluated on a short-term basis, sometimes even monthly. All I want to do is hand in a scorecard when I come off the golf course. I don’t want you following me around and watching me shank a three-iron on this hole and leave a putt short on the next one. Meanwhile, 99 percent of the money in the world is managed by people who feel someone looking over their shoulders, ready to scold them for any mistake. Sometimes stocks are cheap because they have no short-term catalyst to push shares higher. This means that they can languish for a while… But I’ve found that trying to anticipate when other investors’ sentiment will change is a mug’s game. It’s not the end of the world if a cheap stock remains depressed for a while… as long as you have an appropriate investing horizon. I’d argue the only money you should be investing in the stock market is money you don’t need for three to five years. That sort of time frame gives you the patience to wait for high-quality stocks to go “on sale” and for your cheap stocks to start to move (assuming you’re right that they’re cheap!). Next up is another core tenet of value investing: buying when the odds are in your favor. Imagine you’re driving a big truck over a bridge with a lot of other trucks on it that weigh a collective 49 tons. How would you feel if the bridge were engineered to hold only 50 tons? When it comes to important things that your life – or financial future – depend on, you want to give yourself plenty of room to be wrong. Ideally, you want to consistently buy stocks where if you’re right, you double your money (or more) in two to five years, and if you’re wrong, you only lose a little. That brings me to the last way you can put yourself in the position to beat the market: concentrating your portfolio in your best ideas. Over the last half-century, a handful of folks figured out that Buffett is an investing genius, so they put their entire net worth into his holding company, Berkshire Hathaway (NYSE; ticker: BRK). That has obviously worked out well for them, but I highly recommend against such extreme concentration. I think most investors should own somewhere between 10 and 20 stocks. This provides reasonable diversification, yet also allows you to concentrate on your best ideas. These days, it’s becoming harder and harder to find stocks that the market has badly mispriced and undervalued… especially a decade into a complacent bull market like the one we’re in today. The idea that any one investor can have real, proprietary insights – what I call “variant perceptions” – across dozens of stocks is hard to imagine. But by focusing on a handful of situations where you have an edge over the market, you’re likely to do far better than you would by owning dozens of stocks. Editor’s note: Mark your calendars… On April 17, Whitney will go on camera to share his biggest investment prediction in 20 years. And he’ll even reveal the name and ticker symbol of what he calls the “No. 1 retirement stock in America” to everyone who tunes in. Plus, just for signing up to attend this free event, you’ll receive access to a three-part video series on one of Whitney’s favorite companies… behind-the-scenes Q&A videos… and two more of his strongest-conviction ideas. Reserve your seat right here. I guess there is that aspect to it, if you don’t know what you’re doing. See, most people don’t understand options. The reason they were created in the first place is to reduce risk. In fact, the original options were designed to help investors hedge their portfolios against bad moves in the market. Unfortunately, what’s happened over time is what happens to a lot of good ideas on Wall Street…options have morphed into a commission-generating vehicle they sell to folks as a way to get rich quick. Learning the “right way” to use options might involve a little extra effort on your part if you want to trade in the market successfully. But I can help you master the basics… I’ve traded options for nearly three decades. During that time, I’ve also been teaching folks just like you how to reduce their risk with options and add a little bit of “pop” to an otherwise conservative portfolio. Truth No. 1: Buying and selling options is about the least risky and potentially most rewarding game on Wall Street. Truth No. 2: Want to be a winner? Watch your losers! To succeed in trading options, you really need to limit your trading to opportunities that have at least a 3-to-1 payout. A 5-to-1 reward-to-risk ratio, of course, is better. But at minimum, you want to have the potential to pocket $3 in return for every dollar you risk. You accomplish many things by forcing a minimum 3-to-1 discipline on yourself. For one, it forces you to think in terms of reward and risk, which is extremely important. Most failed options traders, even ones that may have had good trading systems, fail because they didn’t pay enough attention to risk. If you’re willing to lose 50% on a position, you’d better be expecting a gain of 150% or more – at least. That’s a tall order. If you’re willing to lose it all (meaning have the potential for a negative 100% return on a position), then you’d better be expecting a 300% to 500%-plus gain in that position. When you see it in terms of risk versus reward, and you realize that 500% winners don’t come along every day, you can see that “risking it all” is a bad bet. Learn how to TRADE OPTIONS the right way! BONUS: Stay until the end of this training and receive Jeff’s Course: Become an Option Pro in 30 Days. Truth No. 3: Big winners make small bets. You’ve got to know when to hold ‘em and when to fold ‘em. But you’d sure hate to fold ‘em and take a total loss with a big bet on the table… So don’t ever put yourself in that boat. Limit the size of your positions. You should only have 2%-3% of the money you’ve set aside for trading at risk on any one trade. We really can’t imagine any combination of circumstances where you should consider putting more than 10% of your trading money on one play. Don’t do it! To end up like Vic Sperandeo over the long run, you’ve got to stick to the program. Limit the size of your positions. And limit your downside by never allowing a small loss to turn into a big loss. Traders who follow this have a chance of being winners in options over the long run. Those who don’t do this will be quickly drummed out of the club, taken for every penny. A few weeks ago, the “pros” on Wall Street started freaking out – about interest rates. Yield curve inversion is when long-term interest rates fall below short-term interest rates. As longtime DailyWealth readers know, it’s often an early warning sign that a recession is on the way. That finally happened in March… And the world is now using it as today’s fear du jour. An inverted yield curve does matter. It is a big deal. But the funny thing is, the “pros” on Wall Street have it all backwards. The yield curve inversion that happened late last month isn’t a reason to fear. It DOES NOT mean we should head for the sidelines. It means we should step up to the plate and take advantage of this opportunity… before it’s too late. 2019 could hugely impact your retirement,” says the man who predicted dot-com crash, housing bust, 2009 stock bottom and bitcoin collapse. See why. Long-term interest rates should be higher than short-term rates. That’s the natural order of things. And it makes sense. If you’re locking your money up for 10 years, you should demand a higher interest rate than if you’re locking it up for only a year or two. The reduced flexibility (and heightened risk) of long-term bonds should come with higher yields. You see, long-term rates are controlled by the market, while the Federal Reserve controls short-term rates. If the Fed artificially pushes short-term rates higher, it slows down the economy. And it’s usually a sign that a peak is coming. Last month, the three-month Treasury yield rose above the 10-year Treasury yield for the first new signal since 2006. This is why the media has been shouting about the inverted yield curve. The question we need to ask is this… What happens next? Stocks weren’t anywhere near a top in early 2006. They went on to soar 26% over the next 21 months before hitting their peak in October 2007. This scenario plays out throughout history. Over the last seven cycles, the first yield curve inversion occurred an average of 19 months before the next recession began. And stocks jumped 19%, on average, through the next market peak. This doesn’t even show the massive 210% gain in the tech-heavy Nasdaq Composite Index over the same period. Tech stocks soared during the final stages of the last great bull market. The story that comes out of these numbers is incredible. It doesn’t tell us to be worried. It doesn’t tell us to panic and move our portfolios to higher ground. Instead, the yield curve inversion tells us to step up and take action. It tells us to be bold and buy. History says it will probably be a year or more until stocks eventually peak. And we’ll likely see big gains between now and then. That’s why today, I urge you to follow the same advice I’ve given throughout this incredible bull market… Stay long. It will go up. Or it’ll go down. In the beginning, it’s really that simple. You buy a stock with just two possible outcomes. But the truth is, things can get complicated really fast. And as that happens, it often leads to one of the biggest mistakes an investor can make: letting your emotions get in the way. I thought I was conservatively managing risk and didn’t want to be greedy. But I had it backward… To build a successful, long-term track record, you must be greedy when the opportunity arises. Finding a monster stock like Netflix only happens maybe once a decade—or even once in a lifetime. So it’s critical that you make the maximum amount of money on such moonshots. I should’ve made more than $100 million on Netflix for myself and my investors. Instead, I made less than $10 million. Of course, that’s not terrible… But it was a costly mistake. Take SodaStream, for example. Its machines help turn regular tap water into sparkling water with the touch of a button. I knew SodaStream had a great business model. The company sells something that people can use over and over. And the carbon dioxide bottles in its machines need to be replaced regularly. So SodaStream was making around an 80% profit margin. But the company had botched its marketing in the U.S. and was also relocating its main factory in Israel, so its sales and earnings were down. I patiently waited until the stock had been cut in half before buying a small position in 2014. It turns out that I was much too early. The company continued to struggle, and its stock kept drifting lower and lower—for nearly two years! Making the right decision in these situations is critical. Had I stumbled into a “value trap” that would never turn around (in which case I needed to sell)? Or was the company still strong, with fixable problems (in which case I should buy more)? In early 2016, SodaStream’s stock took off as I expected. By the time I closed my funds in late 2017, it was up five times. And then PepsiCo bought the company last year for 12 times the price of two years earlier. You must respect the market. The hard truth is that most of the time it’s right—and you’re wrong. My experience with SodaStream is the exception, not the rule. Have you made a research error? Are you possibly missing anything? Have you openly and carefully considered contrary arguments? Have you simply invented new reasons to own the stock (so-called “thesis drift”)? The company had one of the strongest brands in the world, it generated robust cash flows, and its stock traded at a low multiple of earnings. Sure, digital photography was a threat to Kodak’s film business, but it seemed far off—and the company was making investments to compete in the digital space. On one hand, you’re probably telling yourself that if you liked it at the price you bought it at, you should like it more now that it’s cheaper. That may be true—but it could also be a value trap. On the other hand, your emotions are likely telling you to sell… so you don’t have to suffer any more pain and never have to think about this terrible stock ever again. There’s also a powerful feeling of wanting to wait until it gets back to the price you bought it at before selling. Doing nothing may be the best option, but you also must have the courage to admit a mistake and get out… or know that you haven’t made a mistake and buy more. Nick’s Note: This Wednesday, April 17 at 8 p.m. ET, Whitney will be joining Porter Stansberry for a special investing event. He’ll be revealing the secret to his investing success… and announcing the biggest prediction of his career. Plus, you’ll even get the name of the company Whitney calls the “No. 1 retirement stock in America”—just for showing up. And now, you can reserve your spot for this free event right here. Stocks closed the week mildly higher, as we now enter earnings season. We’re right near all-time highs, having virtually erased all of November and December’s losses in the market. The VIX (the market’s fear index) is trading near its yearly lows, at around 12. Over the last 52-weeks the VIX has traded in a range between 10.17 and 36.20. A low VIX means traders are complacent and greedy. A high VIX means that there are fear and uncertainty in the market (VIX was at 36 last December). Keeping on an eye on the VIX along with studying Fed actions helps me get a good gauge for market sentiment. That said, there are times to be aggressive with your trading…for example when stocks are trending… and times to be less active… when stocks are range-bound and trading choppy. For the last two weeks or so the market has been pretty much range-bound. As for me, I’m staying patient, and waiting for my money pattern to appear. Most traders will be looking at earnings results for further clues. That said, it’s a busy week for earnings despite the market being closed on Friday (Good Friday). We’ll be hearing results from companies like Goldman Sachs, Netflix, Pepsi, American Express and many more this week. Read on for the full earnings schedule, economic release dates, my technical view on the market view and a breakdown of my NDAQ trade. The S&P 500 Index is near its all-time high… yet again. What’s interesting to note is the fact the most of the trading activity in the SPDR S&P 500 ETF (SPY) has come from pre-market trading hours… and only a small portion is from the regular trading hours. Now, we’re seeing tight intraday ranges, a decrease in volume and SPY put volumes. With little volatility… the CBOE Volatility Index ($VIX) has been collapsing to extremes. That said, traders have to start thinking… could volatility start to run again, and witness a drop in SPY? Here’s what I’m watching for in the $VIX at these levels. Now, compare the $VIX chart with SPY. Keep in mind these are both on the hourly time frame. With the $VIX at an extreme point, hitting 12… we’re going to be watching volatility and the market closely. More specifically, what I’m looking for right now is the blue line to cross above the red line in the $VIX… and the blue line to cross below the red line in the SPY. If this happens, that tells us there could be a spike in volatility, coupled with a market pullback. Since the $VIX is at a 12 handle, that tells us traders may be too complacent. Well, with corporate earnings announcements coming up… that could cause a market pullback. So it’s going to be a wait-and-see approach for us. What I’ll be watching for is my money pattern in stocks. Just because I’m on the sidelines for market trades, that doesn’t mean I haven’t been trading. For example, on April 5, I alerted Weekly Money Multiplier clients about a bearish trade in Nasdaq Inc (NDAQ). That said, there should be a lot more opportunities like this with hundreds of companies reporting earnings in the coming weeks. That said, let’s look at the economic calendar and the corporate earnings calendar. Citigroup ( C ) implying 4.13% move. Historical average move 4.76%. Goldman Sachs ( GS ) implying 4.65% move. Historical average move 4.09%. Charles Schwab ( SCHW ) implying 4% move. Historical average move 3.34%. M&T Bank Corp. ( MTB ) implying 3.24% move. Historical average move 3.7%. Aphria Inc (APHA) implying 11.01% move. J.B. Hunt Transport ( JBHT ) implying 4.35% move. Historical average move 4.29%. Wintrust Financial ( WTFC ) implying 4.63% move. Historical average move 3.83%. Pinnacle Financial Partners ( PNFP ) implying 3.87% move. Historical average move 3.87%. ServisFirst Bancshares Inc. ( SFBS ) implying 2.95% move. Historical average move 4.46%. 8:00 PM EST Fed’s Rosengren speaks ad Davidson college in N.C.
UnitedHealth Group ( UNH ) implying 4.68% move. Historical average move 4.01%. Bank of America ( BAC ) implying 4.16% move. Historical average move 3.27%. Johnson & Johnson ( JNJ ) implying 3.11% move. Historical average move 3.34%. Progressive Corp. ( PGR ) implying 3.83% move. Historical average move 2.55%. Omnicom Group ( OMC ) implying 3.50% move. Historical average move 5.06%. BlackRock ( BLK ) implying 3.14% move. Historical average move. 3.34%. Comerica Inc. ( CMA ) implying 3.91% move. Historical average move 3.12%. Prologis ( PLD ) implying 3.13% move. Historical average move 2.84%. First Horizon National ( FHN ) implying 5.19% move. Historical average move 3.43%. International Business Machines ( IBM ) implying 5.26% move. Historical average move 6.97%. United Continental ( UAL ) implying 5.11% move. Historical average move 8.49%. Netflix ( NFLX ) implying 8.09% move. Historical average move 9.18%. CSX Corp. ( CSX ) implying 4.15% move. Historical average move 5.49%. Interactive Brokers ( IBKR ) 5.28% move. Historical average move 4.54%. Morgan Stanely ( MS ) implying 4.46% move. Historical average move 4.13%. PepsiCo ( PEP ) implying 2.26% move. Historical average move 2.72%. U.S. Bancorp ( USB ) implying 2.98% move. Historical average move 2.57%. Ericsson ( ERIC ) implying 9.23% move (monthly contract expiring in May). Historical average move 10.41%. Bank of New York Mellon ( BK ) implying 4.02% move. Historical average move 4.21%. Abbott Laboratories ( ABT ) implying 3.64% move. Historical average move 3.71%. Las Vegas Sands ( LVS ) implying 4.28% move. Historical average move 3.75%. Kinder Morgan ( KMI ) implying 2.26% move. Historical average move 3.73%. Alcoa ( AA ) implying 7.37% move. Historical average move 6.78%. Crown Holdings ( CCK ) implying 3.88% move. Historical average move 3.88%. United Rentals ( URI ) implying 7.49% move. Historical average move 6.9%. Crown Castle ( CCI ) implying 2.56% move. Historical average move 2.65%. E*Trade Financial ( ETFC ) implying 4.60% move. Historical average move 4.11%. Atlassian Corp. ( TEAM ) implying 9.39% move. Historical average move 12.53%. Plexus Corp. ( PLXS ) implying 6.17% move. Historical average move 8.83%. Union Pacific ( UNP ) implying 3.12% move. Historical average move 4.78%. Travelers ( TRV ) implying 2.74% move. Historical average move 3.3%. Synchrony FInancial ( SYF ) implying 5.06% move. Historical average move 6.35%. Schlumberger ( SLB ) implying 3.79% move. Historical average move 3.06%. PPG Industries ( PPG ) implying 3.14% move. Historical average move 4.03%. Popular ( BPOP ) implying 5.01% move. Historical average move 5.37%. Philip Morris ( PM ) implying 3.53% move. Historical average move 6.34%. Honeywell ( HON ) implying 2.83% move. Historical average move 2.67%. Genuine Parts ( GPC ) implying 3.69% move. Historical average move 4.97%. Dover Corp. ( DOV ) implying 3.78% move. Historical average move 5.32%. Danaher Corp. ( DHR ) implying 3.46% move. Historical average move 4.16%. The Blackstone Group ( BX ) implying 3.33% move. Historical average move 2.94%. American Express ( AXP ) implying 4.16% move. Historical average move 4.14%. Ally Financial ( ALLY ) implying 4.49% move. Historical average move 4.61%. Intuitive Surgical ( ISRG ) implying 3.50% move. Historical average move 5.7%. Exponent ( EXPO ) implying 5.47% move. Historical average move 6.1%. Glacier Bancorp ( GBCI ) implying 7.32% move. Historical average move 3.71%. U.S. Stock market closed in observance of Good Friday. This is not for the weak willed… nor the faint of heart. This is for bold individuals who are ready to kick Wall Street’s conventional wisdom to the curb. And if you’re not afraid to go against the grain, this is a must-see. You’re invited to an event unlike any other in Money Map Press history. To reveal the exact UNORTHODOX strategy that enabled him to LIVE RICH. This is NOT for folks who are satisfied with the status quo. This event is for individuals who want to learn an unconventional trading strategy… who want to have a shot to change their lives, make fast money, and LIVE RICH NOW. This is a strategy that could give you a shot to make 10X your money – EVERY WEEK. It’s THAT effective. The man who bought Apple at $1.50, Amazon at $56, Netflix at $11 and McDonald’s at $15 urges retirees to buy a surprising stock today.